Preston is a multicultural city with a population of approximately 140,000. Being located within close proximity to Manchester city centre and the Lake district, attracts many commuters to live in Preston due to them having rural and urban living on their doorstep. Preston has also been named, for the second year in a row, the best city to live and work in the North West. Preston is also renowned as a green city, taking home an Avenham Park’s green flag award, which awards the city as the best green space in the country. Preston is home to two large modern indoor shopping centres, two large retail parks and Preston North End FC, a founder member of the football league. 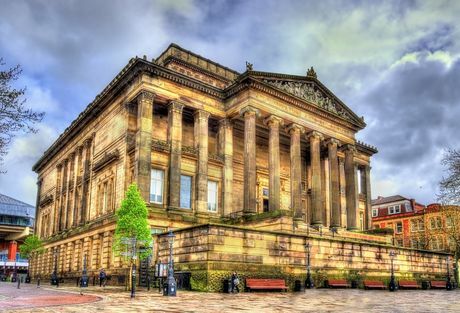 Preston is the third largest city in the North West, with Manchester only a 40-minute drive. The city is home to some of the strongest connections across the region, which are only set to get stronger with Virgin Trains planning to invest £1.5 million on revamping Preston’s mainline. Lancashire county has a total of £25.5 billion economy which supports 650,000 jobs, making it one of the largest local economies in the north of UK. Preston is set to see millions of pounds being poured into the city and it’s growing reputation of its University. UCLAN not only attracts approximately 30,000 students but is also the biggest employer for Preston. Therefore, Preston is on the verge of an economic boom. Preston is continuing to renovate itself, with an economy strategy in place to keep growing the region. One major renovation happening in Preston is the £430 million City Deal. This renovation is set to create 20,000 new jobs, 17,000 new homes, an improved transport and infrastructure and boost the economy. The Market Quarter will also see a £50 million development in Preston city centre, which is set to increase visitors to the city. As part of The Light chain, the development will create an 11-screen cinema, 5 restaurants and a multi-storey car park. UCLAN has already spent £100 million upgrading its buildings, teaching technology and sporting facilities and has now announced a proposal to invest a further £200 million. The £200 million will create a world-class campus by improving the roads, landscaping the campus area, student faculty buildings and £30 million engineering innovation centre. With Preston having 4 nearby motorways (M6, M61, M65 and M55) and excellent transport links, residence will be in the commuter belt for cities such as Manchester and London, which is only a 2-hour train commute. The excellent connectivity has seen an increase in the amount of people wanting to live in the city, resulting in a lack of housing. The city has planned for a new build residential development to tackle the lack of housing. This development will be mainly focussed around the renowned Winckley Square, which features stunning large Victorian and Georgian houses. Hopwood House has recently launch a new development, Guildhall Square, which is located a mere 4-minute walk from the stunning Winckley Square. Guildhall Square is a complete redevelopment of a former commercial property, comprising of 35 high-specification one-bedroom apartments, each designed with the young professional market in mind. Guildhall Square is estimated to be completed in Q3 2018 and offer investors 8% net yield with 2 years rental assurance. UCLAN was founded in 1828 and has since grown a distinguished reputation and world class campus. With the university buildings having a recent £100 million upgrade and a further £200 million upgrade planned over the next 10 years, it is no surprise UCLAN is the 8th largest university in the UK with approximately 30,000 students. UCLAN is the first modern university to feature in the QS rankings alongside being listed in The Times as being one of the top universities for student experience. The university also offers world class academic and sport facilities, 500 undergraduate and 200 postgraduate courses, which has all assisted in attracting students from 120 different countries. Hopwood House has just launched an off-plan student accommodation located a 5 minutes-walk from the centre of the campus. Canterbury Halls truly boasts world class facilities and independent living for students with; a roof-top garden, communal games room, cinema and gym. Canterbury Halls also offers investors 4% interest on deposited funds and up to 9% assured net income.